Real Deal Retirement » Blog Archive » How Would Your Retirement Prospects Stand Up To A Market Meltdown? How Would Your Retirement Prospects Stand Up To A Market Meltdown? Chances are your retirement prospects have improved in recent years. Even if you haven’t exactly been knocking yourself out when it comes to saving, your retirement accounts have probably been growing nicely due to the double-digit annualized gains the stock market has churned out over the past nine years. If you’re already retired, those outsized gains may have allowed your nest egg to retain all or much of its value even as you’ve been tapping it for income. But have you considered how your outlook for a secure retirement might change if this aging bull market stalls or, worse yet, takes a big dive? Just to be clear: I’m not predicting an imminent crash. Even when stock valuations are stretched as they are now, the market can still continue climbing to new highs for months or even years. And many investment analysts expect it to do just that. For example, Goldman Sachs’s chief U.S. equity strategist David Kostin recently forecast that the Standard & Poor’s 500 index would rise 15% over the next three years. At the same time, though, it’s important to remember that forecasts aren’t certainties, and sustained run-ups like the one we’ve been experiencing at some point often end with stocks going into a deep and prolonged funk. Which is why I recommend that you take a moment to give your retirement strategy a stress test of sorts while things are still going swimmingly. That way you can get a sense of how your retirement prospects might change—and what adjustments you might consider making—should the market’s sizzle turns to fizzle. Start this assessment by getting a fix on your asset allocation, as how your retirement savings is divvied up between stocks, bonds and cash will largely determine what will happen to your nest egg’s value if the market tanks. Don’t just guess or assume you know what your current asset mix is based on where you set it in the past. Fact is, your portfolio could be a lot more stock heavy than you think if you haven’t been rebalancing over the years. So you want to go over your holdings individually to see how much of each is invested in stocks, bonds and cash and, based on that, determine what percentage of your savings overall falls into each of those categories. If you’re invested mostly in index funds, this exercise should be fairly simple. You know that a total stock market index fund holds virtually all stocks and a total bond market index fund’s portfolio consists almost exclusively of bonds. (Such funds hold some cash to handle redemptions and such, but the amount is typically minuscule.) But if you have funds that own more than one asset class—say, a balanced fund or a target-date retirement fund—or an actively managed fund that gives the manager leeway to shift in and out of different types of investments, you’ll have to do a little legwork, such as calling the fund to ask for its current asset breakdown or getting it by plugging the fund’s name or ticker symbol into the Quote box that appears at the top of every Morningstar.com page. Once you know how each of your individual holdings is invested, you can easily calculate how your nest egg overall is divvied up between stocks, bonds and cash, from which you can get a sense of how your nest egg might fare in a market downturn. No one knows what the next market setback will look like. But for the purposes of this stress test, you can use a past severe downturn as a guide. From the pre-financial crisis 2007 high to its 2009 low, stocks lost roughly 55%, while the broad bond market gained about 7.5%. Which means that if you have, say, 80% of your retirement savings invested in stocks and 20% in bonds—an allocation that would be appropriate for someone with 20 or more years to go until retirement—and the market has a setback similar in magnitude to the one it suffered during the financial crisis, you might see the value of your nest egg drop by roughly 40%. If you have a more conservative asset mix, say, 50% stocks and 50% bonds—a mix that would be typical for many retirees—the decline would be smaller, or a bit less than 25%. Of course, these figures are rough approximations. For example, I haven’t factored in investment expenses or rebalancing. But the point of this exercise isn’t to try to predict an outcome with absolute precision; it’s to arrive at a ballpark estimate of where you might stand in the event of another market meltdown. Once you have reasonable idea of how much a major market downturn might zap the value of your nest egg, you can gauge how such as setback might affect your chances of achieving a secure retirement or, if you’re already retired, how long your nest egg might last. To make that assessment, you can go to T. Rowe Price’s Retirement Income Calculator, which you find along with other tools and resources, in RealDealRetirement’s Retirement Toolbox. Enter such information as your age, income, the percentage of pay you’re saving each year, your current asset mix, the age at which you plan to retire and the current value of your nest egg. The tool will give you an estimate of the probability you’ll be able to retire on schedule. If you then substitute the current value of your nest egg with your estimate of its value after a market setback, you can see the extent to which your chances of achieving a secure retirement might decline. So, for example, if you’re 40, earn $75,000 a year, save 10% of pay annually, plan to retire at 65 and have $250,000 saved in a mix of 80% stocks and 20% bonds, the tool would estimate that you have about a 70% chance of retiring at 65 on 75% of your pre-retirement income. Plug in the estimated value of your savings after a major market setback—in this case, $150,000, assuming a 40% drop in your nest egg’s value given an 80% stocks-20% bonds asset mix—and you’ll see that the tool’s estimate of your chances of retiring at 65 drop from 70% to about 60%. That sort of decline shouldn’t be surprising in the wake of a major market rout, and it doesn’t necessarily mean you have to take drastic action. If you’ve still got decades to go before you retire, for example, you probably wouldn’t want to shift to a much more conservative portfolio in hopes of mitigating the effect of a market setback, as doing so would likely reduce long-term growth potential of your savings, which could lower your chances of achieving a secure retirement even more. A more effective response would be to try to save more, especially if you’ve been slacking off and effectively relying on market gains to do a good part of your saving for you in recent years. In the scenario above, for example, even after a 40% drop in the value of the nest egg, increasing the savings rate from 10% to 15% raises the chances of success back to where it was before the market setback. If you’re on the verge of retiring or you’ve already retired, the aim of this exercise is to help you get an idea of how much a market slump might affect the level of annual income you can pull from your nest egg without depleting it too soon. To gauge that, you can use the retirement income tool to estimate a sustainable withdrawal rate based on your nest egg’s current value, and then compare that figure to the rate based on your nest egg’s projected value after a market downturn. 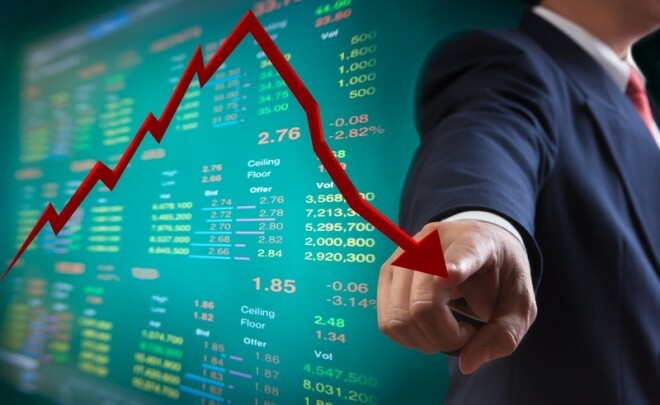 If the amount you can safely withdraw declines significantly, one option is to scale back your stock holdings now to mitigate the effect a market crash would have on the value of your savings. And such a move might make sense if you’re investing especially aggressively as you head into retirement—say, with somewhere north of 60% of your savings in stocks. But you don’t want to invest too conservatively, as doing so might make it more difficult to maintain your purchasing power over a long retirement. So assuming you’re already investing reasonably given your risk tolerance and and other factors—which you can gauge by completing a risk tolerance-asset allocation questionnaire—you’ll want to focus mostly on spending, and more specifically on ways you may be able to pare outlays and reduce withdrawals from savings to give your nest egg a chance to recover lost ground. Doing a retirement budget can give you some insights into areas where you might be able to cut back. You can also consider other possibilities for lowering expenses, such as downsizing or relocating to an area with lower costs, or boosting income, such as working part-time or taking out a reverse mortgage. The idea is to have a variety of moves and strategies you can put in motion quickly should you need to do so.